Design for the 41th Poetry International Festival. The co-operation of plant and robot; the plant is a sensor for the robot (INPUT) and the robot makes it move (OUTPUT). 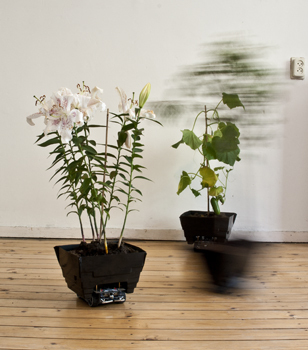 By the combination of programming and sensor-data the plants are able to react autonomously. They are scanning their environ-ment in search for move-ment, persons, and other autonomous plants. They dance, get lost, drive over feet and bump into each other. In this climate they become characters, for example the angry fig.